Did you know that clawfoot bathtubs were considered luxury items back in the nineteenth century? With all the changes in bathroom trends since then, this one has stuck. Are you thinking of remodelling your bathroom and adding this little gem? Not sure where to begin? You’ve come to the right place. Read on for our helpful guide to freestanding and clawfoot bathtubs. The clawfoot bathtub craze began back in the 1800s. A foundry created them out of large cast-iron vats made from farm equipment. They were horse-trough in shape and added an enamel coating for easy an cleaning experience. The coating allowed for a basically bacteria-free surface and stood on paw-like legs. When these baths were first released, they were advertised as a horse trough that could also be used by people. Down the line, baths became less common in favour of showers. Eventually, baths came back as people needed a method to wind down after work. The clawfoot is perfect for that–romanticised as a luxury item for you to soak in. So, if you enjoy soaking amongst bubbles with a glass of wine and a good book, read on for your options and materials. Clawfoot tubs have once again become super popular in today’s society. Because of this rapid rise in popularity, they have been modified to fit a contemporary lifestyle. This gives you lots of interesting options to chose from. Slipper tubs are raised with a gentle slope. This shape allows for a better lounging experience. Slipper tubs are awesome for relaxing after a stressful day at the office. The double-ended tub is raised on both ends with a dip in the middle. Typically, there is a faucet set up in the middle. You can still recline and it’s great for bathing children because of the low spillage risk. These have a great classic look, can be painted any colour under the sun, and have tons of options for shower installations. These tubs are super durable but they can also weigh over 200kg. That means they’re difficult to move around and need plenty of floor support. Acrylic tubs are more lightweight and can be easily carried around from room to room. They are also a natural insulator so the bath water stays nice and cosy longer. It resists chipping, but it does tend to scratch. Make sure to use gentler cleaning methods than you would with cast iron. The clawfoot comes in several different materials for you to chose from. Let’s briefly go over the pros and cons of each. Acrylic is lightweight and easy to move around as stated before. They are also inexpensive and come in a variety of shapes and sizes. The cons are that they are still more expensive than fibreglass and scratch easily. As stated above, cast-iron tubs are durable. They can be painted just about anything and still look fabulous. Best of all, they keep in the heat for a longer bathing time. The cons are that they are super expensive due to difficult installation. They’re also hard to move around because of the weight. Solid surface tubs are super durable like the cast-iron, and they also keep in heat. It is really easy to repair this material when it’s damaged. The cons are that the cost is almost triple the amount of acrylic–and they are super heavy too. Stone tubs are absolutely stunning to look at. You will impress all of your guests with a huge wow factor. The cons are that they are as heavy as they are gorgeous. Your floor will need to be specially reinforced before you bring it in. The price tag is huge too because they’re almost always custom made. With the rise in popularity, there are many bathroom trends that accompany it. A lot of consumers are partial to the all-copper look with matching faucets and accessories. Some enjoy the tub/shower look of a freestanding tub too. These are just a couple of styles that you can choose from. There are endless options for the look of the claw-feet and accessories as well. Like anything else, there are pros and cons of freestanding or clawfoot tubs. Let’s start with the pros. They are super easy to install. You simply bring in the tub, set it up where you want it, and then place the plumbing. In addition, they are a really attractive element in your bathroom design. It gives it a classic, traditional look that your guests will admire. They are super durable in any material. They tend to last decades–long enough to become family heirlooms. Best of all, they are super comfortable. If you enjoy long soaks after work, a clawfoot will become your new bestie. We’d be remiss if we didn’t mention a few potential drawbacks, too. They are difficult to clean. They raise off the floor, which is all well and good–until you have to clean underneath it and there isn’t enough space to do so. The enamel surface also has special cleaning instructions as well. If you put the tub on a wooden floor, water damage is inevitable. You have to make sure the whole floor is tiled and water-tight. They can be expensive after installation costs if you have to reinforce the floors and pay for special plumbing. Regardless of the pros and cons of owning clawfoot bathtubs, they’re sure to bring a sense of elegance to your bathroom that will completely wow anyone who sees them. They are great for relaxing after a hard day–and who doesn’t deserve that? 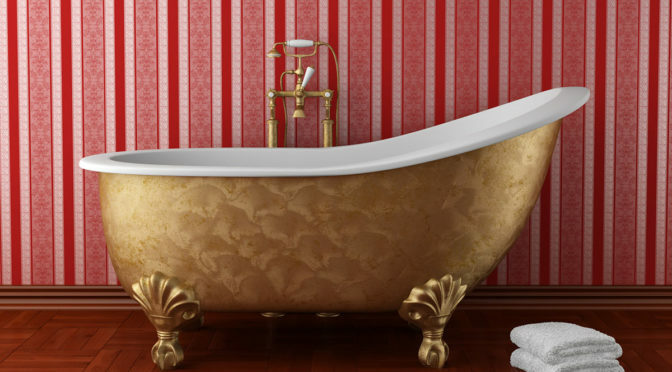 It’s time to treat yourself to one of these comfortable, luxurious tubs. For a complete run through of acrylic vs. cast iron materials for your tub, read more here.